Return 7500: is used for indoor transfers between wheelchair and bed, wheelchair and toilet/ portable toilet bed/wheelchair and arm chair. Is also used to aid repositioning further back in a chair. Designed for easy manuvering and use in confined spaces. Easy to assemble and dissassemblt in just two sections for easier transport and storage. 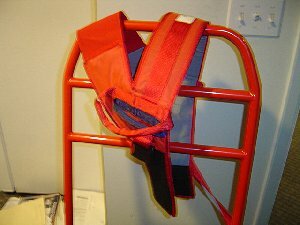 Also includes the ReTurn Belt used for raising to a standing position and for support if needed during transoport with the Return 7500. Ladder runds are also useful for therapy to strengthen legs. Original price was $1402 + $140 sling.